Our Disaster Welfare and Support teams are made up of highly committed, multi-skilled volunteers. Read more about their responsibilities, training and how you could join them. 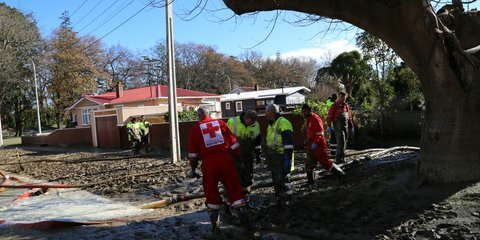 Our Disaster and Welfare Support volunteers offer a hand during the Whanganui floods, June 2015. Our volunteers have a wide variety of professional backgrounds, delivering essential services during and immediately after a disaster. Team members train and respond in their local area but may travel throughout New Zealand to support other Red Cross teams during emergencies. Our volunteers are available for 24-hour, seven-day call out, for periods of up to five days (excluding travel days) when responding to emergency events. Many of our volunteers have full-time or part-time jobs that support their volunteer work and remain flexible when emergencies occur. Other specialist skills as required. Regular training opportunities are provided at no cost and are delivered to industry best practice. 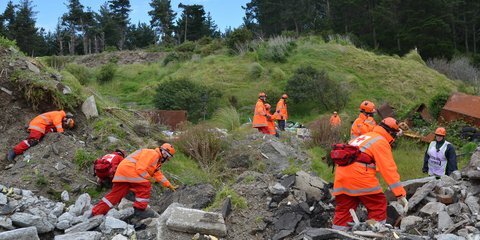 We regularly take part in scenario-based exercises with other Red Cross response teams and partner agencies including the New Zealand Defence Force, Police, Urban Search and Rescue (USAR) and Civil Defence. Opportunities are provided for volunteers to travel and practice at exercises both nationally and internationally. We use modern equipment, 4WDs, trucks and medical supplies and have pre-positioned disaster relief stocks throughout the country. All of our team members are provided with a uniform and protective equipment. We recruit volunteers for our response teams as required, depending on volunteer team levels. Following your initial enquiry, you will be asked to attend an information evening, where the roles and responsibilities of the team will be explained. At this meeting, should you decide that becoming a response volunteer is right for you, you will receive an information pack with all of the information and forms you need in order to become a volunteer. Any other applicable educational certificates. From this information applicants are assessed and short-listed, subject to a Police check. Be able to maintain good spirits, even in adverse working conditions. Sound like something you want to be part of? Join us! We look forward to hearing from you. Your support is a sign of hope. You'll help to meet immediate and longer term needs, whether it’s by providing relief to communities affected by disaster, sending aid workers overseas to assist those made vulnerable by conflict, or helping refugee families resettle in New Zealand. Red Cross has been responding to the severe flooding across the country and has launched an emergency appeal to further help the people hardest hit. Cyclone Cindy was an emergency preparedness exercise based on the severe storms that swept through thelower North Island in 2004.